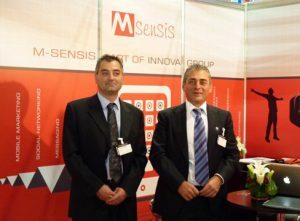 mSensis is delighted to announce that has successfully exhibited for the first time in the GITEX Technology Week 2011 held in Dubai, 9-13 October 2011. GITEX Technology Week is one of the largest and most important ICT events around the globe. GITEX delivers a leading platform for industry innovation and an impressive track record of attracting the biggest names in the IT sector, connecting over 3,500 domestic and international IT vendors with more than 136,000 ICT professionals. mSensis had the pleasure to introduce our multipurpose platform that delivers a wide range of services in Mobile Marketing, Mobile Payments, Mobile Banking, Self Care, Social Networking and Messaging sectors. GITEX, now recognized as the largest and most important business-to-business ICT event in Middle Eastern, African and South Asian markets, offered mSensis the opportunity to explore and create new potential business cooperations in the area.